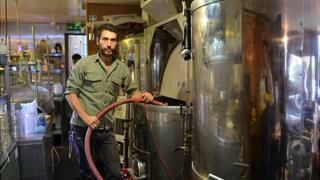 In the cramped kitchen of an east London bar and restaurant, Logan Plant is brewing. He holds a tube in both hands, from which hot water is pouring into a stainless steel grain-filled vat and there is a sweet smell in the air. "We've blown a few things up," he quips. "There have been a lot of angry chefs." You may have heard of his dad - Led Zeppelin frontman Robert Plant. "He loves his ale," Logan Plant says. "He's been a big influence on my career." Duke's Brew & Que restaurant, in Hackney, is the nerve centre of Beavertown brewery, which was set up this year by Mr Plant, 33, originally from the West Midlands, and Byron Knight, 42, from Los Angeles. They named their brewery Beavertown as this is the old cockney name given to its location - De Beauvoir Town - which was famed across Victorian London for its local breweries and ale houses. Beavertown is one of a number of new breweries that have appeared on the London scene in recent years, as the industry has undergone something of a renaissance. In fact, the capital has more active breweries than at any time since the 1930s. In 2006 there were seven, now there are 30. UK cask ale sales have increased for the first time in 20 years, according to the Campaign for Real Ale (Camra). In the pubs and working men's clubs of the 1940s and 50s there were strict customs governing who stood where. To be invited to sup at the bar was a rite of passage for many young men, and it took years for women to be accepted into these bastions of masculinity. As the country prospered and foreign travel became widely available, so new drinking habits were introduced as drinkers discovered wine and, even more exotically, cocktails. People began to drink at home as well as at work, where journalists typified a tradition of the liquid lunch. Advertising played its part as lager was first sold as a woman's drink and then the drink of choice for young men with a bit of disposable income. About 2.2m barrels of real ale, about 633 million pints, were sold in 2011 - a 1.6% rise. Good Beer Guide editor Roger Protz puts this down to "a big sea-change in drinkers' attitudes". "The British love supporting the underdog and a lot of people would now prefer to support local breweries, rather than big international brewers," he says. Breweries that have sprung-up over recent years range from east London's Red Church, which produces the light and grassy Shoreditch Blonde, to south London's Meantime, locally famed for its fruity, heady 6.5% London Porter. Beavertown launched its maiden brew just before Christmas 2011, but Mr Plant was fine-tuning his brewing skills before then. "I used to homebrew, so whilst we were planning the project, I was constantly in my kitchen knocking out recipes," he said. Meanwhile, Mr Knight, who says he has "worked in restaurants and bars all my life", devised a food menu that would best complement the beer. Duke's opened in February 2012 and Mr Knight says since then, things have moved so fast, "every day feels like a year". After the beer is brewed in the kitchen, the rest of the production and bottling takes place in a garage down the road. A one-man distribution team then travels around the country "getting to know the owners of all the bars so they can recommend the product", Mr Plant says. But the hard work seems to be paying off and they now have plans which should please a few of the chefs. They intend to move brewing from the kitchen, and set up a brew house down the road, in early 2013. Mr Plant says the secret to success is to "have a clear vision of what you're doing it for". That has meant a few brews have been tipped down the drain for not being up to scratch. "It's worth taking the hit and keeping your reputation intact," he says. "We're constantly evolving and doing new stuff so it keeps us inspired." But all is not looking rosy for the real ale trade. About 18 pubs are closing across the UK each week, according to latest research by Camra. The Good Bear Guide's Mr Protz says "big brewers don't sell heavily discounted beer to pubs as they do to supermarkets, which sell beer as a loss-leader". He says the closure of more than 450 pubs since March is "tragic". "Pubs are great places to meet up with friends and chat," he says. "If you lose your pub, the community will start to die." The pub closures may also deter a few aspiring brewers in the making. Logan Plant has his father to thank for encouraging his interest in ale during his teenage years. "He really influenced me as a kid because he used to drag me around every pub garden possible," he says. So what does the Zeppelin singer think of Logan Plant's career sidestep? "He absolutely loves it," Logan Plant says.